Well, sometimes it happens. In week three of my rescue mission I lost no weight. I also gained none so I see that as a positive. I also enjoyed the 4th of July and indulged so I think I earned my results. Here is how my week looked. Not terrible, not great but I feel fine about it. I’m also at the weight it says on my driver’s license. Not a bad place to be. My workouts weren’t as coordinated as last week but overall I’m still happy to see continued progress. For me, the first week is always the easiest and from there it is all about keeping it going. I know for this third week I need to focus on getting back to yoga and planning my lunches better. It should be a lot easier because I’m only working today and tomorrow. Yay for the 4th of July and a couple vacation days. I have a feeling that a five day weekend is going to rock! Thanks for keeping me accountable and have a fantastic week! Happy Monday! I hope you all had a fantastic weekend. I promised an update on my Wardrobe Rescue Mission last week so here it is. As far as my food went, I really tried to focus on lots of fruits and veggies. Also, you should probably know, I don’t eat red meat or pork ever so many of my days were full on vegetarian. I’m a big fan of avocados, eggs, fruit and big salads. Additionally, I hate feeling like I’m totally restricted even when I’m trying to be super health conscious so if you looked at my diary you would see a chocolate cupcake I had to taste test before giving the batch to my Dad for Father’s Day, a slice of pizza and a beer at a concert I attended on Wednesday, a few peanut M&M’s from the work place candy dish, and a couple of non-fat chai tea lattes on the mornings I just couldn’t get going without some caffeine and a cozy cup. So, what is my plan going forward? Well, the weekend was busy since Saturday I ran in the Mayor’s Marathon Five Miler Race and Sunday I finished moving (three flights of stairs down at my old apartment and three flights up at the new house). 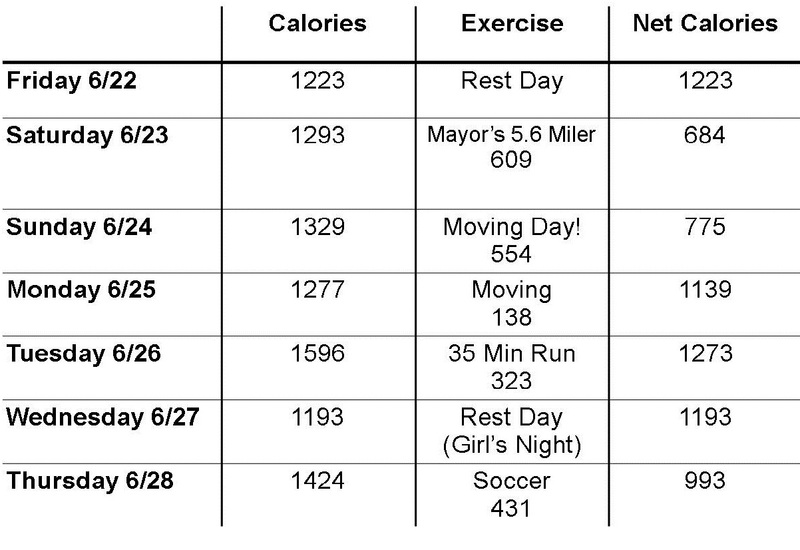 Today I’m planning on yoga and a run, hiking Tuesday, yoga Wednesday, and a soccer game Thursday night. Wow, I’m gonna get back in my skinny jeans in no time.